Though smoking may not be the best thing to your health, smokers have come up rather creative ways to exhale their smoke. 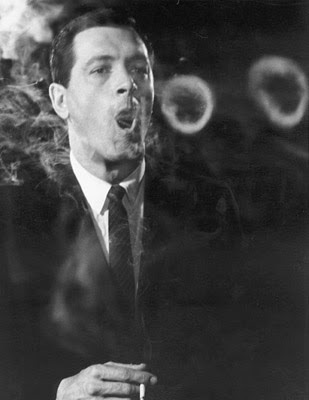 For decades, smokers have been forming smoke rings as crowd pleasers or for own personal entertainment. Smokers, though capable of blowing these captivating rings, may not know the reason these rings form. It turns out that the rings are a product of fluid dynamics known as vortices. The fluid pressure in vortices are lowest in the center and rises as the distance from the center increases. This is due to Bernoulli’s principle. Bernoulli’s principle states that “as the speed of a moving fluid increases, the pressure within the fluid decreases.” (Mitchell Science). As the air in the vortex center moves the fastest, the vortex center will have the lowest pressure in comparison to its surroundings. In every vortex, there is something known as a vortex line. A vortex line is at the core of every vortex and start or end at the boundaries in a fluid or will form closed loops. This creates the circular ring seen in smoke rings. Vortices can interfere with each other, either constructively or not at all. That is, parallel vortices circulating in the same direction will merge to form a single vortex. Conversely, vortices may not combine if they are have opposite circulation, evident in airplane wingtip vortices where the two vortices spin in opposite directions but do not combine. This is due to a difference in air pressure among other reasons beyond the scope of this article. In a smoke ring, these principles explain why a smoke ring forms. The movement from the smokers mouth creates a disturbance in the surrounding air and as a result, creates a circular vortex. But why do the rings travel through the air? In fact, though it seems like the ring is moving air forward, the surrounding air does not move. As the website Science Hobbyist explains, “No air is moving on average. Think about it. If air was moving, then there would soon be less air at the right side of the diagram, and more air on the left side. But every time a dot moves forwards, some other dots are moving backwards. There is an overall circular flow, but air in general is not moving from right to left. If we put some smoke in the vortex, it appears that something is moving form left to right. But smoke misleads us, since the smoke doesn’t show the backwards flow which cancels out the forward flow”. Thus, in a smoke ring, the air is simply displaced around the ring while the air within the vortex simply circles within the ring. The smoke is carried along within this ring and creates the smoke ring seen. I know you have not taken the Fluid Mechanics course, so you are certainly excused for the little faux pas! … but Bernoulli’s principle applies strictly “following the streamline”, i.e. for one parcel of air as it moves from one place to another. Interestingly, though, the way to prove that the core of a vortex is at lower pressure is the similar to a way to prove Bernoulli’s principle, but moving perpendicular to streamlines! I hope I’ve piqued your curiosity, and you’ll be eagerly awaiting your Fluids course.